I make this cake just about every year for my little sister's birthday and apparently, I've never posted a picture of it. I forgot to bring my camera to the party so here's a picture of the piece I took home. 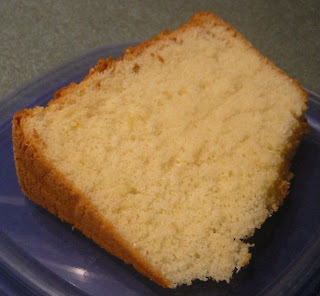 The cake itself has a nice lemony flavor and is similar to an angel food cake in texture. It was served with a raspberry coulis and fresh whipped cream. Also vanilla ice cream and potato chips -- it was a birthday party after all. This cake is also known as the go-nowhere, do-nothing cake.